Medicine and Technology: Happy World Down Syndrome Day! Today, 3/21, is World Down Syndrome Day. In case you didn’t notice the clever date, it was picked to celebrate people with three copies of chromosome 21. The purpose of this day is to promote awareness and understanding about Down Syndrome, and acknowledge the amazing capabilities and personalities of these individuals. 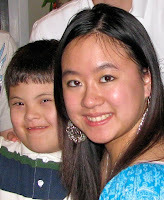 I am fortunate enough to have a family member with Down Syndrome. My cousin Andrew is ten years old and one of the most fun and loving people I know. During the holidays, I visit him and his family, and we play games and watch movies with his two brothers. We enjoy our time together so much; I do not even notice his “disability.” He participates in Kung Fu with his dad and older brother, plays sports, and has even made the honor roll at his school. Our whole family is extremely proud of him. Around the world, people are finding their own ways to support people with Down Syndrome. The Plus15 campaign for the Down Syndrome Research and Treatment Foundation is matching donations 3:1 today. In Dublin, Ireland, the first model agency for people with Down Syndrome, I’m Able 2 Model, made its debut. In medicine, we often focus on the science behind Down Syndrome—the chromosomal abnormality and related pathologies. We are taught all the negative aspects of this trisomy, and rarely do we celebrate all of the positive aspects—the beaming smiles, enthusiastic hugs, and tremendous talents of people with Down Syndrome. Today (and every day! ), let’s acknowledge the incredible abilities of these people, and the joy that they bring to our communities.